‘He who has not climbed the Great Wall is not a true man’ declares a Chinese saying. After being confronted by the challenging steps of this legenday wall, I must admit that I understand fully the meaning behind this expression. The Great Wall consists of a massive series of fortifications which extend over five thousand kilometres from east to west in north China. Since it outstretches over a number of provinces, one can visit its diverse sections from various locations. Its construction took around two thousand years and it involved the input of several dynasties which were ruling the country during different period. Since for many years, various Chinese states were at war against each other, by the 7th century BC, the locals had already mastered an excellent skill in the building of protective walls with which to defend their villages. It was from this period that construction of the Great Wall commenced. In 221 BC, Qin Shi Huang succeeded to win over all his opponents. He unified China for the first time, established the Qin Dynasty, and became the first Emperor. To impose a centralization of authority, he ordered the destruction of various defensive walls which had been built around the country by different feudal lords. Instead, he constructed new walls which connected a number of fortifications that were situated in the northern side of his empire. These were intended to shield his people and his country from the opponent nomadic tribe Xiongnu which resided in this area (today known as Mongolia). It was no easy feat to construct these walls in the chosen locations which winded throughout valleys or climbed across mountains. At the time, no machinery was available to facilitate this grueling work. 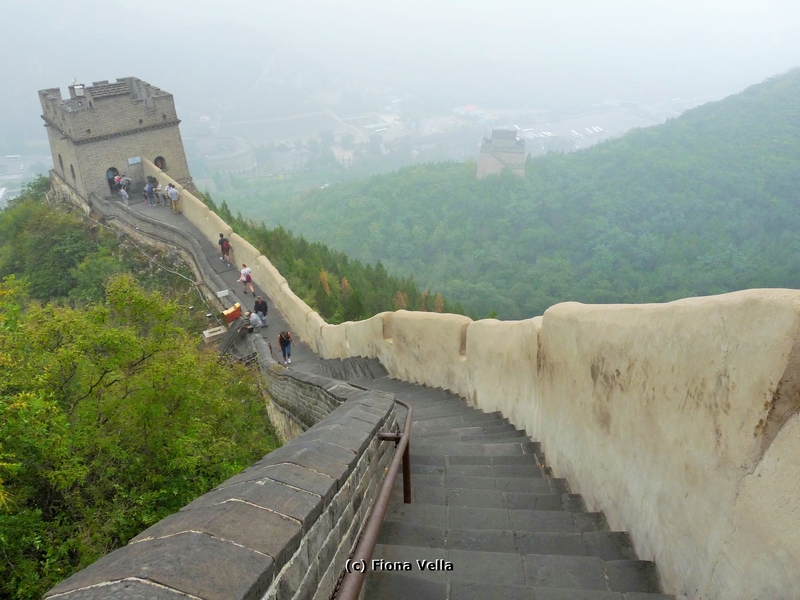 Yet, the Chinese managed to erect these walls by utilizing the material that was available in each particular zone and by working according to the contours of the terrain. No one knows how many people worked or died during the construction of this wall. Many insist that the total number could easily reach millions. Certainly, their effort led to the creation of a unique masterpiece which today is regarded as one of the seven wonders of the ancient world. In 1987, the Great Wall of China became also part of the UNESCO World Heritage List. This wall is imbued with many narratives and legends. 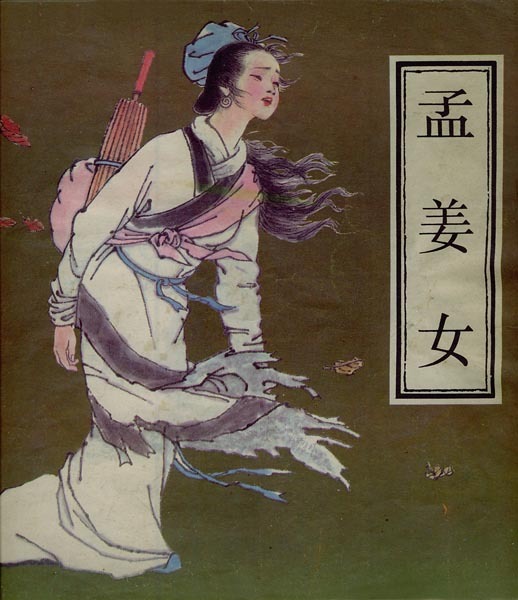 Yet the most popular is surely that of Meng Jiang Nü; a young woman who is believed to have lived during the 3rd century BC, in the Qin Dynasty. Her story recounts that one day, Fan Qi Liang, a young man who had been engaged to work on the Great Wall, succeeded to escape from this strenuous job. He ran with all his might along the way until at one point, he was so exhausted that he stopped to hide in the garden of Meng’s father. The two fell in love immediately as soon as their eyes met, and some time after, they got married. Yet unfortunately, their happinness did not last long as the man was located by soldiers and he was taken back to work on the wall. The woman waited and waited for her husband’s return. But when winter was close and he still did not come back, she sewed some warm clothes for him in order to protect him from the cold. She went in search of him at his work place but after she looked out for him wherever she could and inquired about him, she was finally informed that her husband had died and that he had been buried within the wall itself. This tragic news shattered the woman’s spirit and she was so griefed that she spent a whole day and a whole night weeping beneath the wall. Her desperation ran so deep that suddenly, the wall in front of her crumbled and a number of corpses slid out of it. Shocked at this gruesome scene, Meng Jiang Nü cut her finger and she allowed her blood to trickle on the corpses. At one point, she noticed that all her blood ran to a particular corpse and it was then that she recognized her husband’s body. She gathered him lovingly and gave him a decent burial. Then, she walked to a river and ended her life within. 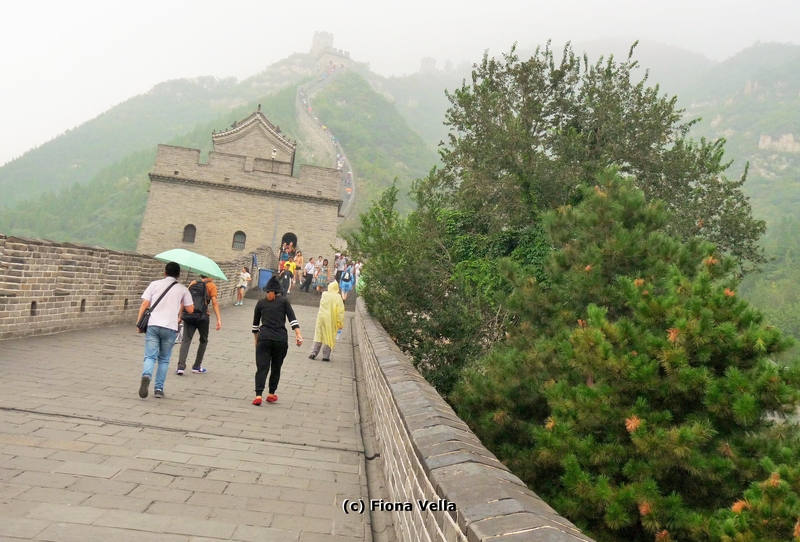 I had read and heard so much about the greatness of this wall that when I arrived at one of its sections in Beijing, known as Juyongguan Pass, I simply stood in silence and in awe. My eyes ran afar, up into the sky where a thick fog was hiding the highest part that was visible from the ground. 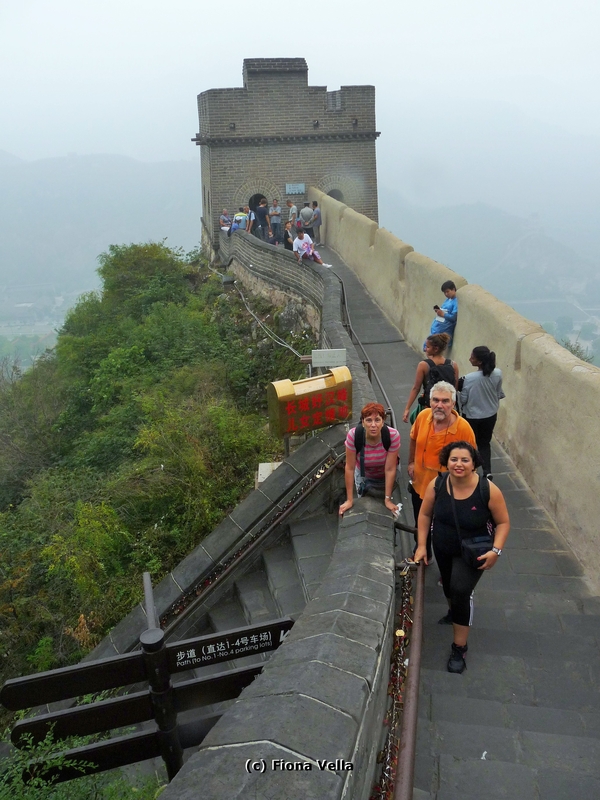 Located at around fifty kilometres away from Beijing, this part of the wall is about 4000 metre long and is situated amongst the mountains of Changping District. This pass has always been renowned for its strategic significance and its impenetrability. Notwithstanding this, in 1644, a group of rebellious farmers led by Li Zicheng, managed to enter into Beijing by overcoming this area. It is said that this happenned not because of any weakness in the wall but due the fact that the local people were too impoverished to resist. Today, Juyongguan Pass is distinguished for its lovely scenic views of the surrounding forests, particularly since these change their colours according to season. We arrived at nine in the morning in order to avoid the crowds but there were already many visitors climbing the wall. The weather was not very welcoming as it was drizzling and the fog made it difficult to take very good photos. Yet nothing could stop us from climbing that legendary wall which we had all dreamt so much about! Up we went the first steps but soon we realized that it was not going to be that easy to climb too far. For the Great Wall’s steps were constructed in differing heights in order to make it difficult for the enemy to run up and make a surprise attack. Whilst some of the steps were low, others were quite high and after a short time, if you’re not the sporty kind, you’ll definitely find yourself out of breath. Step after step, we arrived at the first tower which consisted of a number of small rooms. I decided to check out a set of narrow stairs which led to the tower’s roof and from there, the overview of the open landscape was even more splendid. I looked around in a blending state of rapture, wonder and disbelief as I imagined that this could have been the same view that the legendary soldiers watched over. For a moment, time seemed to stop and the present melted into the past as I simply stood there holding on to the ancient stones. I could have stayed there to absorb within me all the history of the place but the group needed to move on and so, we climbed further. 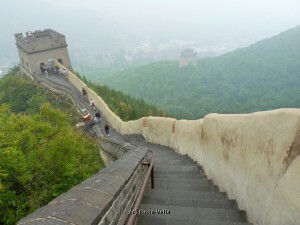 Over all, the set up of the wall repeats itself as its length is divided into steps and a number of towers. Yet I can say that I would have continued to climb all day if we did not have planned to visit other sites. Going down the steps was relatively easy but by then, the place had become quite crowded with people of all nationalities who came to visit. 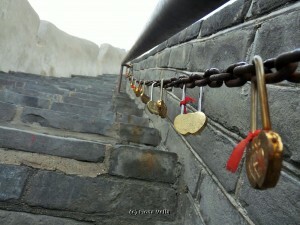 As I stole a last glance at this architectural and historic marvel, I noticed a quantity of lovelocks that were fastened to chains running along the Great Wall. On a closer look, I found out that these were decorated with heart designs and the names of couples were engraved on each of them. Our guide told us that those lovelocks formed part of an old Chinese tradition which stated that if a couple wrote their names on a lock and closed it on this chain, their love would be eternal, just like the destiny of this mythical wall.